Meg and I watched the advance screening of the SM CinExclusive: Barbie in the Pink Shoes yesterday at SM Megamall Cinema 6. The little girl was so excited that she's in character for the movie and wore her favorite Barbie shoes! We were early so I was able to take pictures and saw the excited faces of the little girls in line. Some wore crowns, brought their Barbie bags, and of course dress up like Barbie! 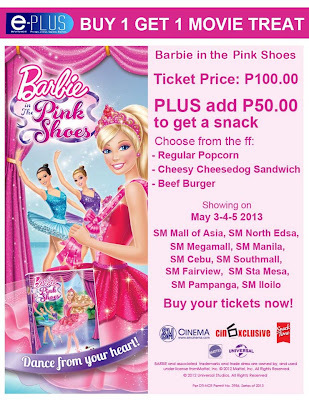 Barbie in the Pink Shoes is showing on May 3, 4, and 5 at selected SM Cinemas: SM Mall of Asia, SM North Edsa, SM Megamall, SM Manila, SM Cebu, SM Southmall, SM Fairview, SM Sta Mesa, SM Pampanga, and SM Iloilo. 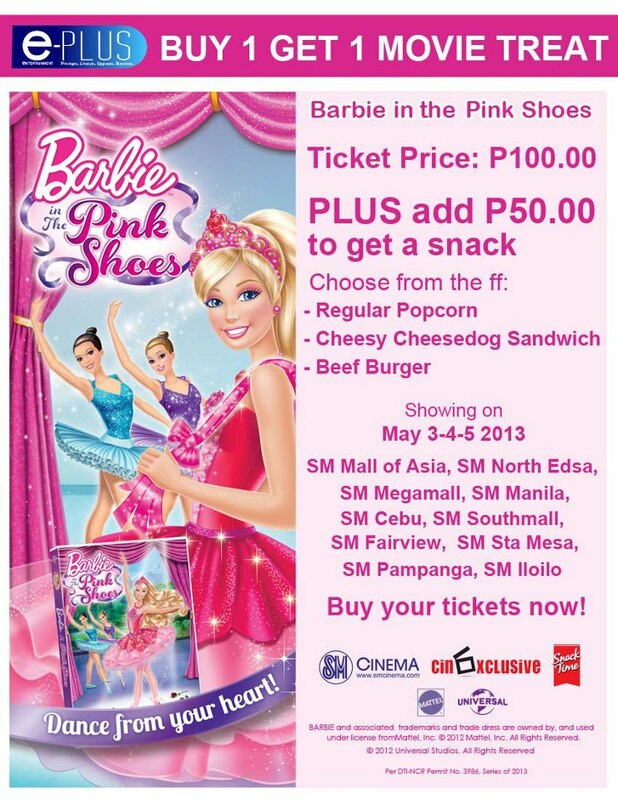 For only P100, your little princesses will surely WOW themselves as they watch the movie. Plus, you can add P50.00 to get a snack and there's a Buy 1 Get 1 Movie Treat for e-plus card holders. Awesome! Watch Barbie as Kristyn Farraday, an aspiring ballerina. Kristyn is a hardworking ballet dancer but the lead roles always end up going to Tara. While Kristyn is practicing for a showcase, Madame Natasha reprimands her for not following directions. 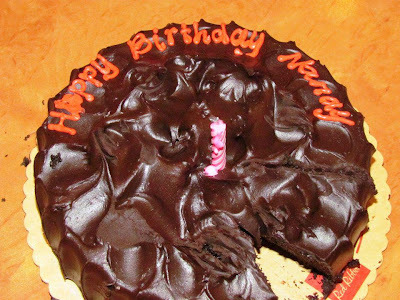 This brought down Kristyn’s confidence and made her feel like a failure. In order to make herself feel better, she decided to get a new pair of ballet shoes. She visits the wardrobe mistress, Madame Katarina who gives her a pair of bright pink ballet shoes. When Kristyn puts the shoes on, she is transformed to a fantasy land of classical ballet sets. There, she realizes that she needs to keep dancing her favorite ballets in order to defeat the wicked Snow Queen. Well what can I say about the movie? Aside from Meg said WOW in every scene and stood up to imitate Kristyn's ballet steps , this movie as well as other Barbie movies is not that all for fashion and others may call it "kaartehan". I watched with Meg in all the Barbie movies released and every movie has a moral lesson. Pink. Pink symbolizes love and beauty. Love for family, friends, and self-worth. This movie has it all. 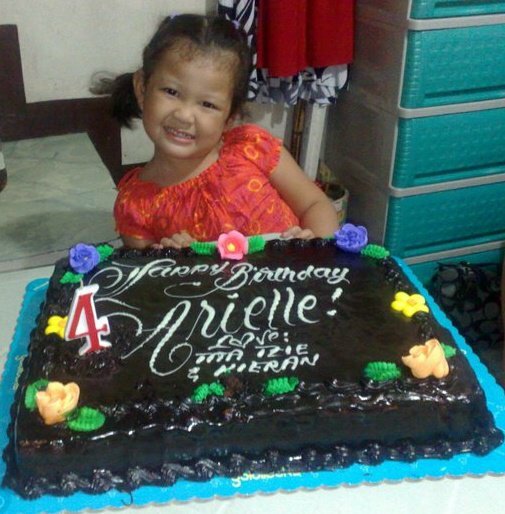 It encourages kids to keep on dreaming and stick to that dream no matter what. 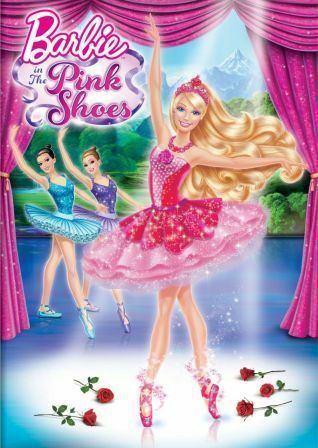 Kids below 4 yrs old may not fully understand the message of the movie but they will definitely enjoy the animation, the ballet dance in every scenes, and all the sparkling ballerina dresses. It feels like MAGIC! Shoes. It can be depicted as possession, as having the power and strength over your life. Kristyn may have lose herself in the process of fulfilling her dreams. But as the story goes and shifted to an imaginary fantasy, she realized she needed to continue to excel in what's the BEST for her. She danced in the flow of music and allowed herself to enjoy. The movie has humor, full of imagination and will allow your daughter to explore her creative side. It teaches the value of friendship, that money can't buy anything, and that dreams do come true. As the theme song of the movie says, "Keep on Dancing" - keep on dreaming, work hard for it, be yourself, and you will overcome all your fears. Go with the flow of your life and as you fulfill your dreams, don't forget to enjoy and love every moment of it. Follow your heart and continue to dream. Watch this movie with your daughters and I'm very sure they will LOVE it! The song keeps on playing on my mind and Meg had a hang-over from watching the movie and dances ballet as we go outside. Barbie in the Pink Shoes is an SM CinExclusive. It's still my birthday month! 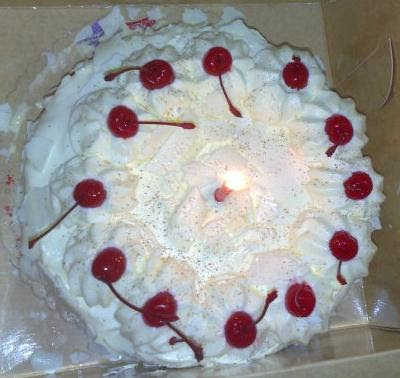 Allow me to share some of my favorite cakes. 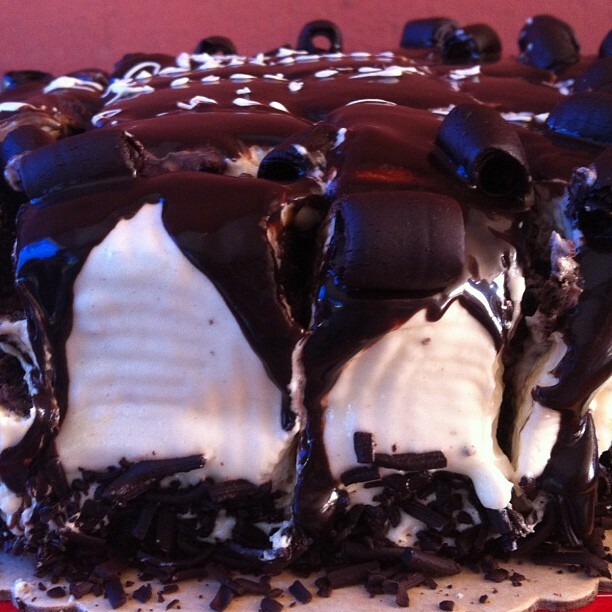 My usual favorite is the 7th Heaven (pictured above). 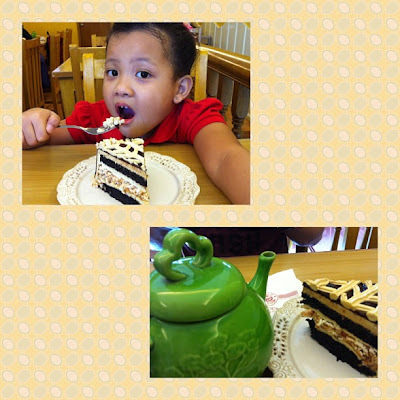 The cakes are affordable and not so sweet, even my mother loves it together with her tea. You can't go wrong with Red Ribbon! Although the cakes are really sweet, I love their chocolate cake and Tiramisu Meltdown. Plus, branches are all over the metro and in different malls so it's very convenient. 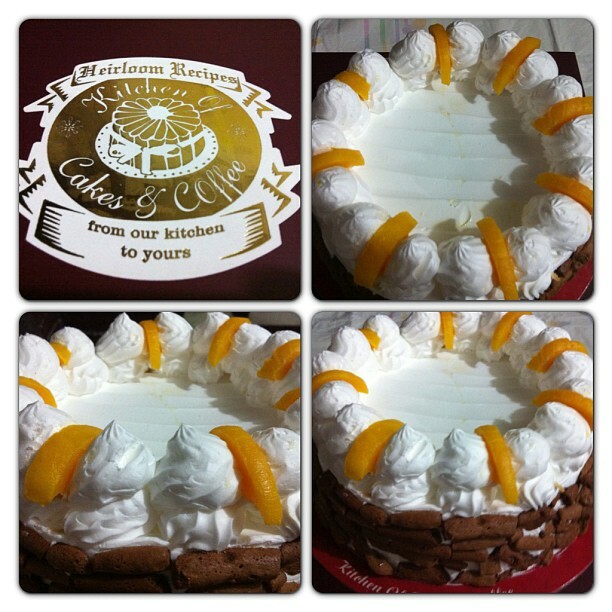 If I love Red Ribbon cakes, I also love Goldilocks cakes. They are almost anywhere like Red Ribbon. My ultimate favorite is their Mocha cake, Brazo de Mercedes, and Sans-rival. This is one of the best Sans-rival for me. Aside from it's very near us, I also love their Choco Revel Bars. 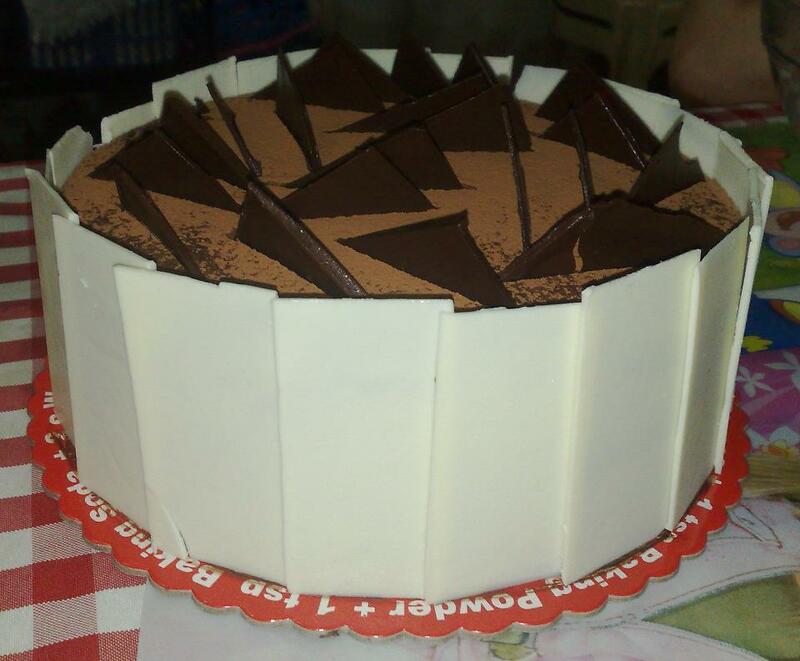 Yey for Estrel's! 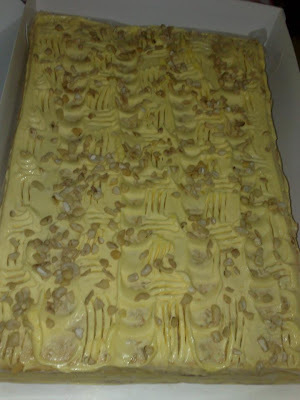 This caramel cake is almost on our table in every gathering. 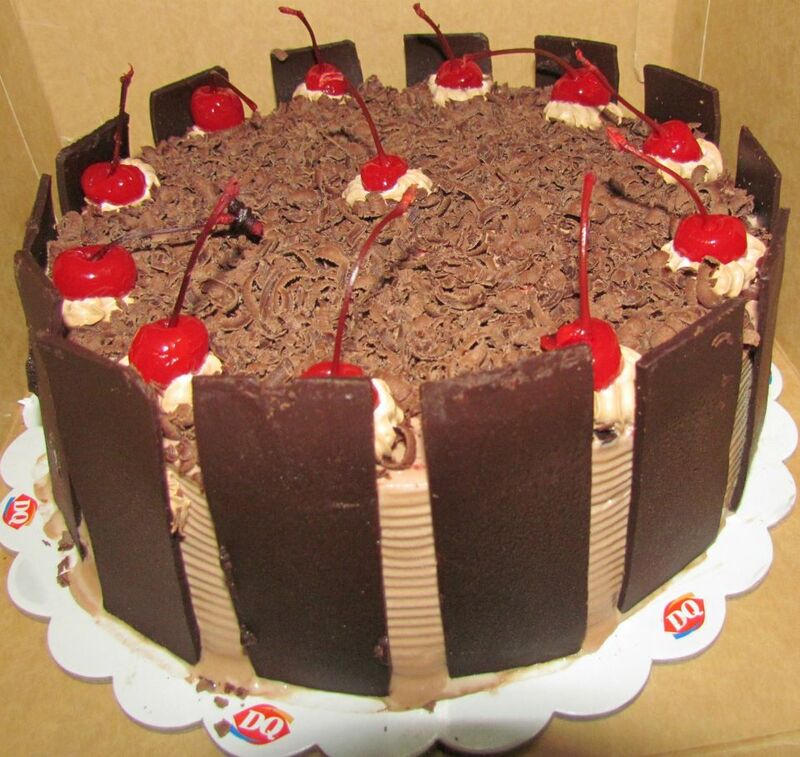 It's soft, DIVINE in every bite, and look at the lovely design. The first time I saw the cake, I though it's the same flowers as the others cakes but turned out it's also soft like icing. 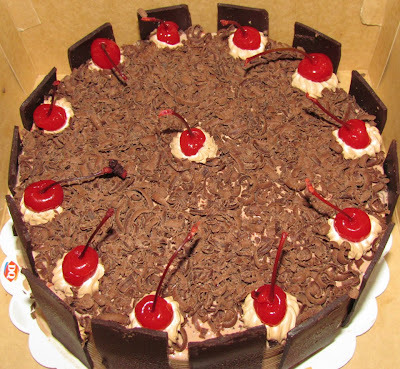 The downside is they only have one branch and the cakes are made-to-order, they limit the selling of the cakes to their walk-in customers. 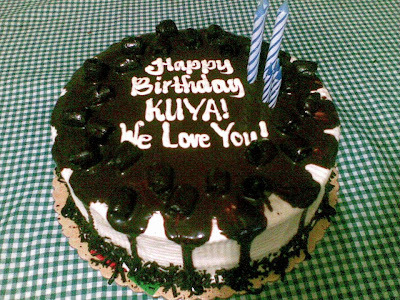 Plus not all can be accommodated during their peak season and in every occasion. More of my favorites. 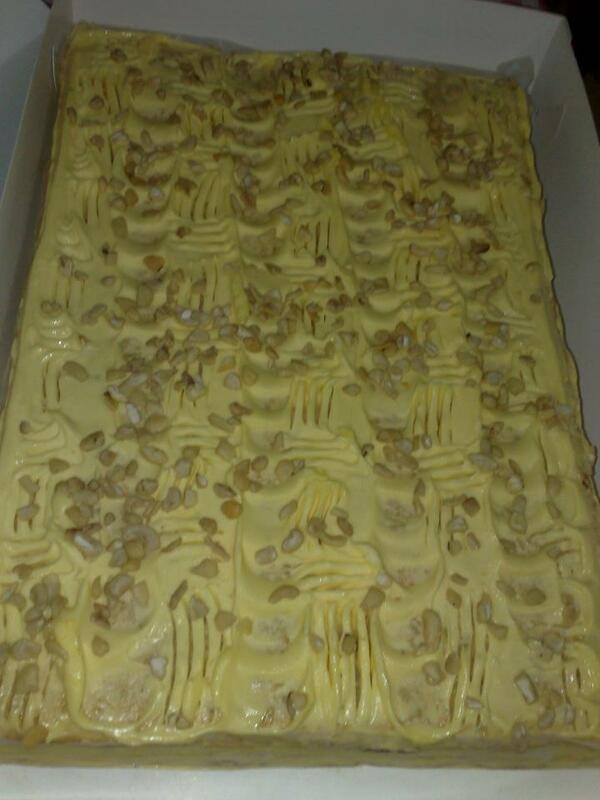 Sorry, I have a sweet tooth. 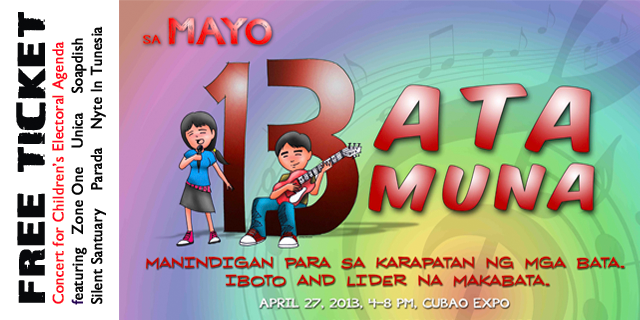 Bata Muna invites you to a free concert dubbed "Sa Mayo 13, Bata Muna" APRIL 27, 2013, 4-8PM, CUBAO EXPO! Bring your friends! The "Bata Muna" Campaign brings children’s rights into the arena of politics and governance with the opportunities offered by the coming 2013 national elections. It aims to provide a venue for children and civil society to collaborate on a non-partisan campaign for children’s electoral agenda for governance formulated by child-led groups who were convened in the “Mahalaga Kami, Unahin Kami”. 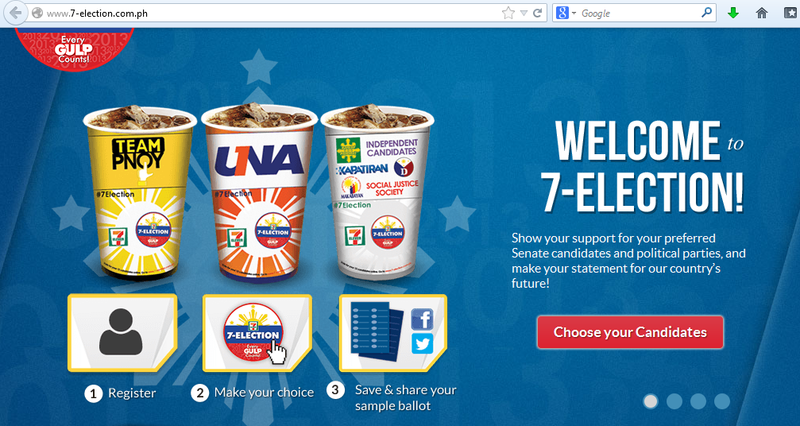 7-Eleven continues their election voting campaign since they started last 2010. It is a way to contribute to nation building efforts as it aims to promote voter awareness and participation through a fun and unique way of voting. 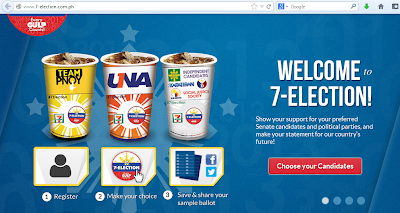 Customers may vote by purchasing any 16oz Gulp® beverage (from the selection Coke, Pepsi or Del Monte Gulp® drinks) featuring the three designs of the different senatorial coalitions. Available cup designs are the yellow cup representing Team PNoy, the orange cup representing United Nationalist Alliance (UNA) and the white cup for independent candidates as well as smaller parties such as Ang Kapatiran, Bangon Muna, Democratic, Makabayan and Social Justice. Each purchase of a Gulp® drink in any of the cup designs counts as a vote for the respective parties. For the white cup featuring multiple parties, the barcode for the party of the customer’s choice will be scanned to accurately reflect the vote. An extension of the 7-Election polls is the online voting, where customers may vote for individual candidates by visiting 7-Election. No purchase is required to vote online, however users may only vote once, as in actual elections. 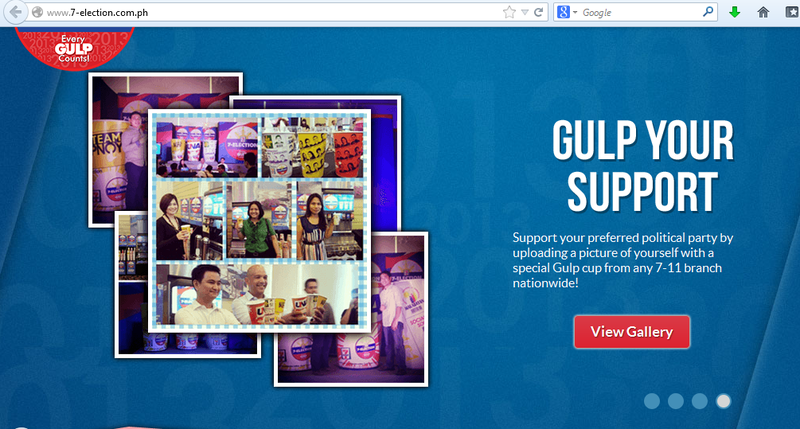 Viewers can find the results of both the votes cast using both the Gulp® cups and the online polls. The campaign will make use of the #7Election hashtag online to tag all content relevant to the Gulp® polls as this is promoted through social media to push for voter awareness. 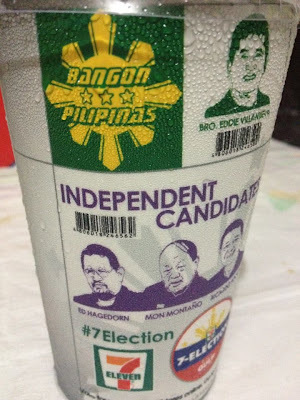 The beauty of the informal 7-Election polls is that it is transparent since all 7-Eleven stores will be able to track the sale the 7-Election Gulp® cups. Voting updates for the Gulp® cups and online polls shall be posted in leaderboards across all stores weekly. Regular updates will be open to the public in the website, social media and via strategic LED billboards placements in key transit areas in Metro Manila. The final tally will be released on May 7, 2013. Updates on the votes will be displayed at 7-Eleven stores. Stand up and be counted. GULP your vote now! Difficult and massively changing time affects the education of our children. With this, changes in curriculum are needed to prepare them for the future. We need to adjust in this age of digital natives (modern), and use it as a tool for teaching kids. Even with these changes, how we learn hasn't changed. Our developmental stages of learning are still the same and we only need to adapt to the modern world. We all know that TEACHING is to help children learn but we seem to forget that TEACHING and LEARNING should also be FUN for them. What kinds of learning will our children need and how they should learn from it? We need to give them the knowledge and the skills to help them understand. EDUCATION is an ACTIVE process. Thus, new ways like the IPC (International Primary Curriculum), a theme-based curriculum which focus on the children's skills is a very helpful development in our education process. The launching of Eton as they adopt the IPC curriculum was held last April 13, 2013 at Edsa Shangri-la Hotel. Eton gets creative with theme-based curriculum and takes a leap on their education system to create a higher quality of education and produce better students. The launch highlights the symposium entitled "Think Global. Start Young. Start Now. A Symposium for Parents and Educators." with one of the most sought after speakers, IPC London Regional Manager Katie Fitch. Fitch is an IPC practitioner-trainer who has a wealth of practical experience gained from her 13 years of IPC work in European and Asian academic institutions. Since 2000, she has been providing training and support to schools implementing the IPC, as well as staff professional development. International Primary Curriculum (IPC) is a new teaching method which is based on socially relevant themes and has been adapted by 1,500 schools in 100 countries. It uses real life experiences and takes it on a learning experience for the kids and let them use their power of imagination and pretend play. Assessment comes first and exploring the Multiple Intelligence types and see which type describe the children's strength. This same goes to children with special needs. Finding out what adaptations to use after the assessment and what support system is right for them. It is a personalized method of learning which has an individual approach to each student - finding out what they know and develop it more and celebrate their strongest point. IPC is a comprehensive, thematic, creative curriculum designed to achieve three goals for personal, academic and international learning. It covers over 80 different thematic units of learning, which are considered to be child-friendly and modern-day topics appealing to all ages of primary children. Learning in IPC takes a global approach to develop "international-mindedness" among students. It helps children to connect their learning to where they are living now, as well as looking at the learning from the perspective of other people in other countries. “The Filipino child of the 21st century deserves a curriculum that will enhance his personal development and international-mindedness. In learning, the child has to be both engaged and connected with a global of community of learners,” said Eton President Dr. Jacqueline Marzan-Tolentino. After IPC was explained thoroughly, questions were entertained and answered by Ms.Katie Fitch and Dr. Jacqueline Marzan-Tolentino. Contract Signing between ETON and IPC took place after it. Disclaimer: I don't represent the school Eton. I attended the event and relate what transpired and what I have learned from it. I was invited to a Pre-Mother's day event launch earlier this afternoon at Precious Moments Gift Shop and Restaurant. I'll make a separate post about the restaurant since I want to go into details of this awesome event for us MOMS! PRECIOUS MOMents Free Treats for Moms is an event by the Philippine Precious Moments Collectors' Community (PPMCC) as they celebrate the 35th anniversary of Precious Moments. It will be held at the Amanpulo Hall & Presidential Security Group Grandstand Malacañang Park, Manila City on May 5, 2013 from 10 AM to 4 PM. As they promote the corporate values of loving, caring, and sharing; this event will be for MOMS and the whole family to share and to have fun! There will be different pampering activities, talks, and special awards exclusively for Moms. Some of the activities highlight Health which includes Bone Density Scan, Oral Health, Pap Smear (discounted), and Blood Typing to name a few. It is also a day of pampering for moms with massage, spa, haircut, makeover, and nail art. All Moms will also be treated extra special by giving roses. There will also be lectures, skills training like cake decorating, entrepreneurship training and health and wellness lectures in the afternoon. Program starts at 3:00 PM with special awards for Moms, special number, and an inspirational talk. 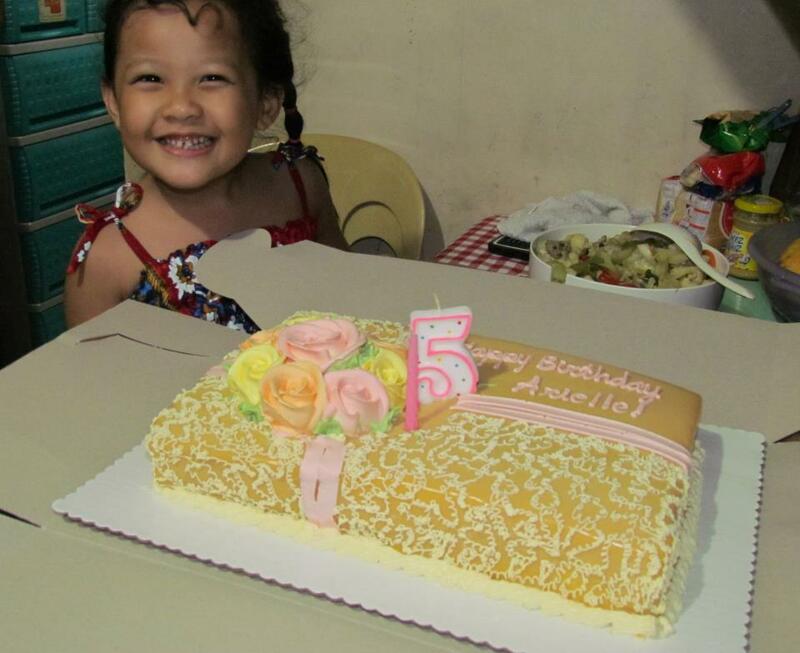 With the kids around, they will also have a Play area, coloring activities, and games. Pre-register and CONFIRM your attendance on or before April 28, 2013 and get a FREE PRECIOUS MOMENTS LOOT BAG. They changed the deadline posted on the poster to accommodate those who haven't heard of the event. If you have questions or clarifications, please call (02) 8875252 or 3871092 and look for Ms. Amiel Carmona. Just remember that this event is FREE but you need to pre-register. Pre-register now! Moms will definitely enjoy this event and if you're single and want to make Mother's day extra special for your Mom, this is perfect! Cheers!